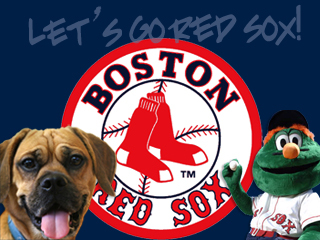 Boston Red Sox might be in trouble this season. It seems like they might need a little extra cheer to boost their spirits! 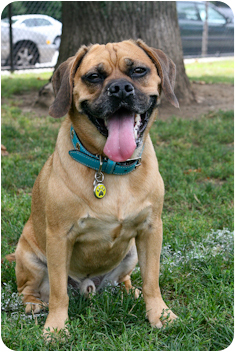 Move over Wally the Green Monster, here comes Preston the Puggle! 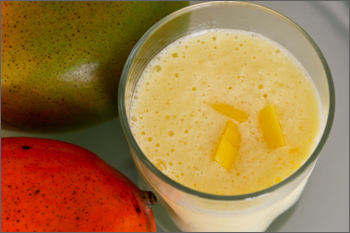 Mango lassi (Indian yogurt drink) is one of Mommy and Daddy’s favorite drinks for a hot summer day. Mommy made a doggie friendly version of mango lassi for Preston. 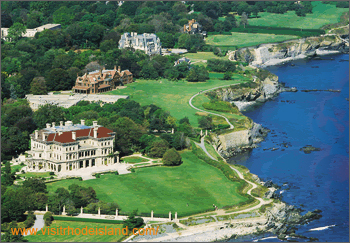 Preston spent Saturday in Newport, Rhode Island. 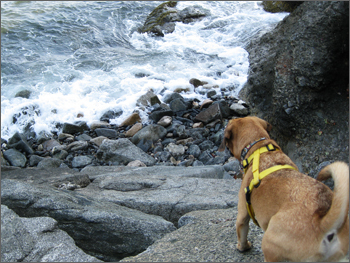 Although he couldn’t visit any of historic Newport Mansions, he enjoyed the beautiful Cliff Walk. 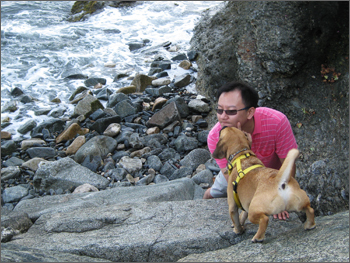 But a kiss for Daddy is worth the risk. 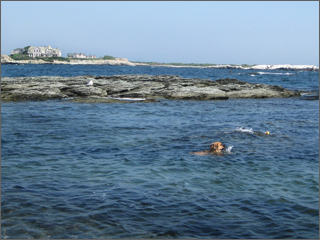 Preston had his first ocean swim. See the dramatic rubber duckie rescue mission. Preston loves going to pastry shops with mommy. 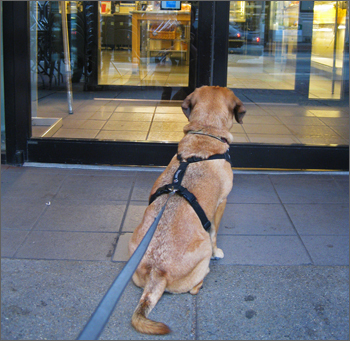 He always waits patiently outside the store. 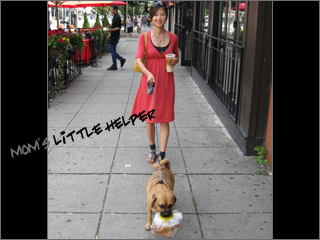 He knows that mommy has her hands full with his leash, the coffee and the “goodie bag” from the pastry shop. He volunteers to be mommy’s little helper. 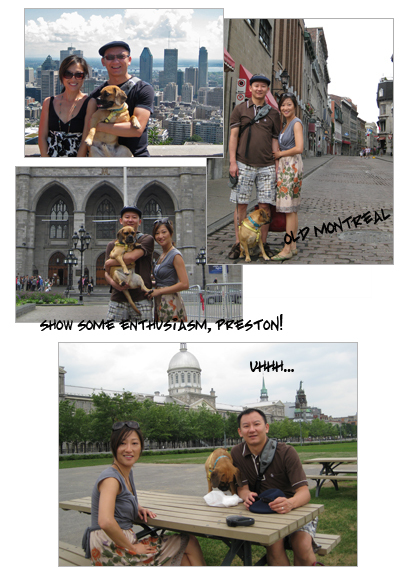 Preston traveled across the border to Canada and spent a weekend in Montréal, Québec. Montreal is beautiful! but at the blazing 85F+ weather, sightseeing wasn’t really Preston’s thing. The highlight of the trip for Preston was all the yummy gourmet he got to sample. Preston’s lack of interest in sightseeing could be evidenced in ALL of the family pictures. 1. It is about 5.5 hrs drive from Boston to Montreal. 2. 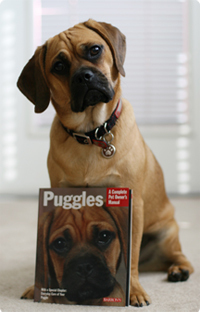 Proof of rabies vaccination is needed to travel into Canada and back into the US. 3. Poutine is French-Canadian food made of french fries, cheese curds and gravy. La Banquise is a great place for poutine. 4. Expect a long long line out the door at Schwartz’s Deli. Going early (smoked meat is available after 10am) is strongly recommended. 5. 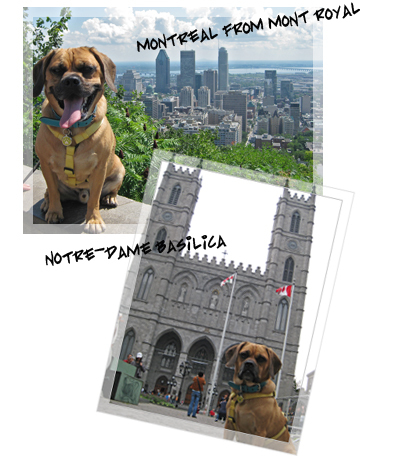 Montreal’s Metro and the Underground City are not dog friendly. Bummer!